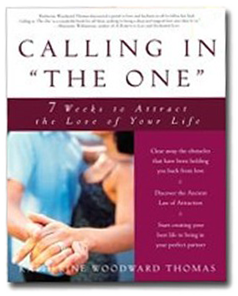 Leading luminaries such as Deepak Chopra, Neale Donald Walsch and Marianne Williamson are celebrating Calling in “The One” as a uniquely powerful, trailblazing, approach to love and soul-mate partnership in the 21st century. Why? It begins where few other approaches do—on the inside. 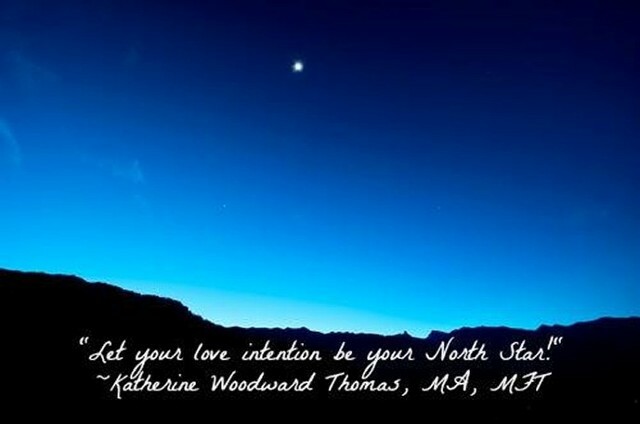 Based on the bestselling book Calling in “The One” by Katherine Woodward Thomas, M.A., MFT, this internationally renowned, transformative, process is designed to powerfully support you to identify and release the inner obstacles to love. As a private coaching structure, Calling in "The One" begins with a formal (60-minutes) introductory session. If we decide the program is a fit for you at this time, we become partners in your transformation. ~ Set a powerful intention and anchor into your vision of love fulfilled. ~ Learn to identify your healthy needs in relationship. ~ Identify and transform your limiting, false, beliefs about yourself, love and relationships. ~Begin to cultivate the profound, yet practical, skills of self-love as the foundation for extraordinary love and partnership. ~ Become magnetic to the love of your life---your Soul's true match---by becoming a vibrational match to your Soul first. ~ Lovingly transform chronic self-abandonment which is the number one reason why relationships fail. ~Learn how to take consistent responsibility for the way you feel. ~ Discover how to create a welcoming space for love in your life. ~ Source your sense of self from the deeper truth of who you are. ~ Cultivate your capacity to give and receive great love. ~ Complete the relationships of the past: renegotiate old agreements, release old resentments, and create empowered relationships in all areas of your life. ~Connect with your own, personal, source of unconditional love that is always, always, there in a way that transforms your life and relationships from the inside-out. ~Setting the Calling in "The One" Intention. ~Initial exploration and assessment of your hidden, inner, barriers to love. ~Become generative of love everywhere as you shift focus from love as something "to get" to love as something to become. ~Identify your healthy needs in relationship. ~Identify how your relationship with self has been mirrored in the relationship with others. ~Vision and access a somatic experience of love fulfilled. ~Identify how to shift your home environment and create a physical space to receive love. ~Engage a process of releasing past resentments. ~Identify and renegotiate covert agreements from the past. ~Identify toxic tie dynamics with an empowering focus on self as source. ~Identify the meaning made about yourself, and others, inside of past wounds and begin to question these assumptions. ~Blending traditional psychotherapy with leading-edge transformative coaching principles, experience an awakening of who you really are on a Soul level. ~Discover why taking responsibility for the way you feel is necessary to create a successful relationship with another. ~Learn to tap into your own, personal, source of unconditional love as the foundation for extraordinary love and partnership with another. ~Identify your wounded false beliefs (your hidden inner barriers to love) with unprecedented clarity. ~Access the deeper truth of who you are and experience a transformation of your beingness. ~Identify new ways of relating that are in alignment with who you are on a Soul level. ~Become a vibrational match to your Soul in order to attract, and create, a thriving relationship with your Soul's Mate. ~Create a somatic vision of love fulfilled sourced from the deeper truth of who you are on a Soul level. ~Revisit the original Calling in "The One" Intention. ~Identify your sense of self inside the future of love fulfilled and begin to embody this version of you in the present. Session Five: Becoming "The One"
~Make a solid commitment to yourself as the foundation for making, and receiving, a commitment from your future partner. ~Identify the underlying motivation around the impulse to give to others and cultivate "healthy selfishness" as the basis for healthy partnership. ~Anchor into a deep sense of worthiness to receive love. ~Create deeper truth statements around your attractiveness and desirability. Session Six: Aligning with Your "Love Destiny"
~Deepen into the profound, yet practical, skills of evolving self-love. ~Cultivate your capacity to self-soothe. ~Learn to take radical, loving and empowered emotional self-responsibility. ~Articulate your deeper feelings, needs and desires to others. ~Become resilient in service to your growth and development toward being ready to receive love. ~Identify ongoing practices to keep possibility alive and become generative in attracting love. ~Source your identity from the future of love fulfilled. ~Identify new ways of being, as well as structures, inside of living into the future of love fulfilled. ~Anchor into a deeply somatic, unflinching, magnetic knowing that great love and partnership is not only possible but inevitable. Private sessions are conducted on phone, Skype or FaceTime. Calling in "The One" process.